EMCEE & HOST FOR ALL OCCASIONS! Festivals, Civic Celebrations, Conventions, Corporate Functions, Fund Raisers, Galas, Events for the Arts, Theater, Bar/Bat Mitzvahs, Awards Banquets, On-Camera Reporting and Commentary, Audio / Video Presentations...all occasions! 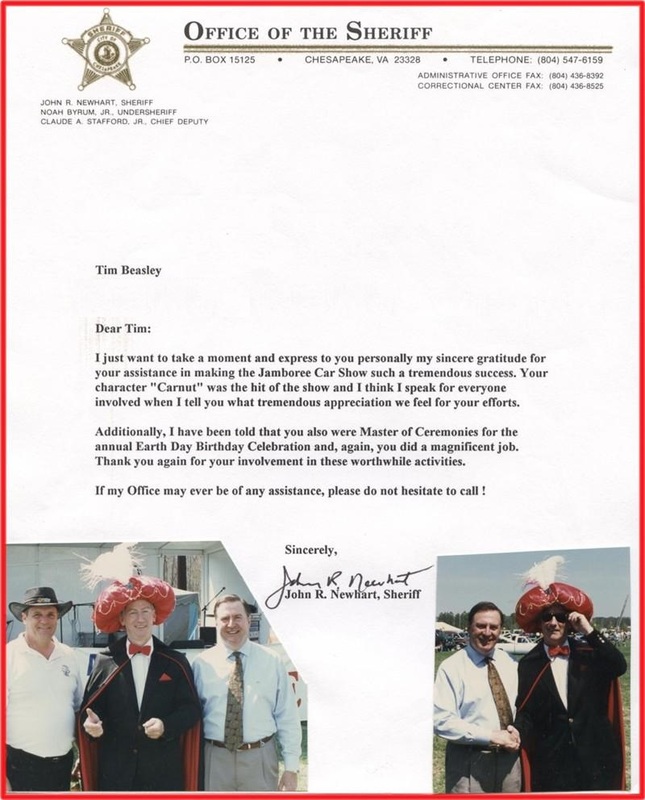 Tim Beasley as himself, or in his variety of unique "celebrity" roles as Emcee has opened many, many special events as the "guy with the voice," emceeing a very wide spectrum of civic functions, festivals, theater shows, fund raisers and banquets for over 32 years, licensed and insured as an entertainer owned company since 1986! These events organizers have sought Tim out to be "their man on the microphone," as a talented and very experienced stage presenter and multi-media speaker, representing their organizations, companies, products and venues and keep their event in the very best light from the reception, through beginning the program to the "good night ladies and gentlemen!" Tim's knowledge and knack for keeping programs right on schedule is why these events seek out Tim...for him it's a natural talent, blended with years of "on stage" experience and insight. 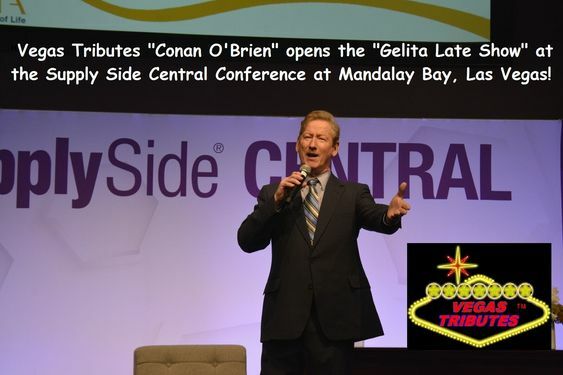 A recent big event had Tim as another "latenite TV host, "Conan O'Brien" hosting the corporate event "Gelita Late Show," a top sponsor of a huge foods trade show in the Mandalay Bay Convention Center, Las Vegas. 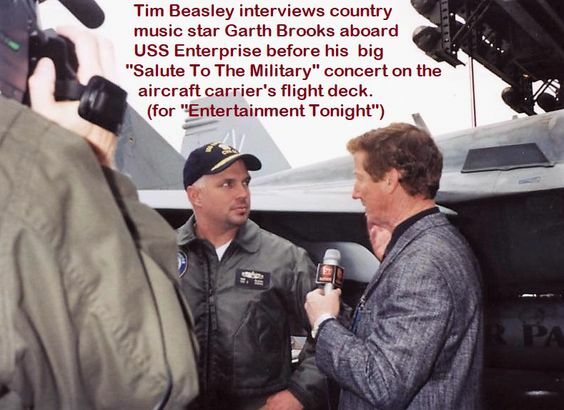 One unique broadcast event took place when the nationally syndicated nightly TV entertainment news program, "Entertainment Tonight" contacted Tim to be their "reporter" for a big news event featuring country superstar Garth Brooks. Garth was performing a concert salute to the military aboard the US Navy aircraft carrier, the USS Enterprise, the "Big E." Tim had been recommended for this project, as well as also interviewing "Survivor" contestant, former Navy Seal and senior citizen Rudy Bousch, who was a national sensation due to his remarkable performance in the gruelling reality show! 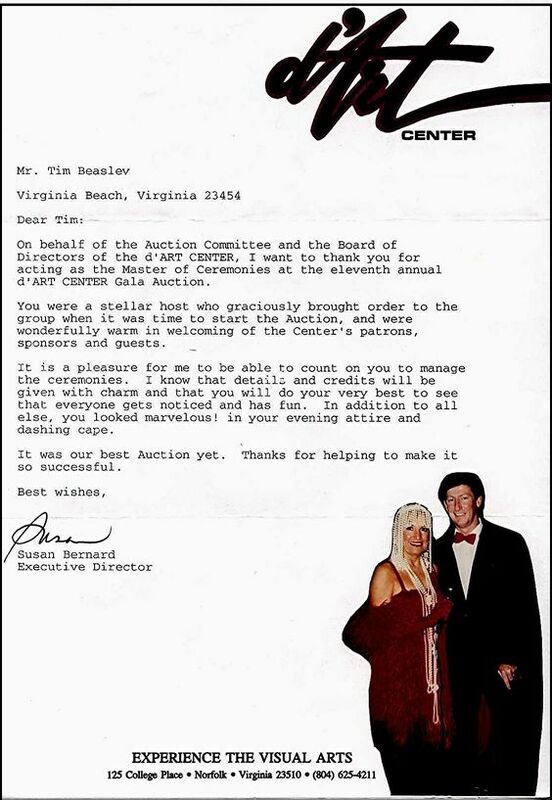 Several notable clients / events that represent Tim's reputation is he was the Emcee for the City of Virginia Beach, VA's Parks and Recreation Dept., and he headed up a great variety of public events every year, for 15 consecutive years. These included the "Artisans in the Park" where over 200 national -international artists came for a two-day exhibit and competition, and also the very popular "Fourth of July" in the city's main park attended by over 30,000 spectators. Rounding out those Parks & Rec special events were the fun "K-9 Karnival" family dog festival, the "Kites Day," and other city wide events every year. 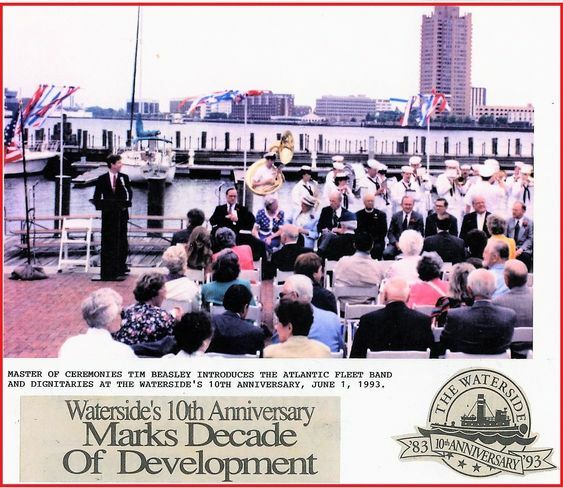 Another was his emceeing the big 10th Anniversary of Norfolk VA's "Waterside Festival Marketplace," introducing the US Navy's Atlantic Fleet Band, Norfolk's Mayor and other dignitaries and a salute to the venue itself, and another in the retail world was the grand opening of Sam's Club first location in Virginia Beach, VA, and many Wal-Mart Super Center grand openings on the East Coast. 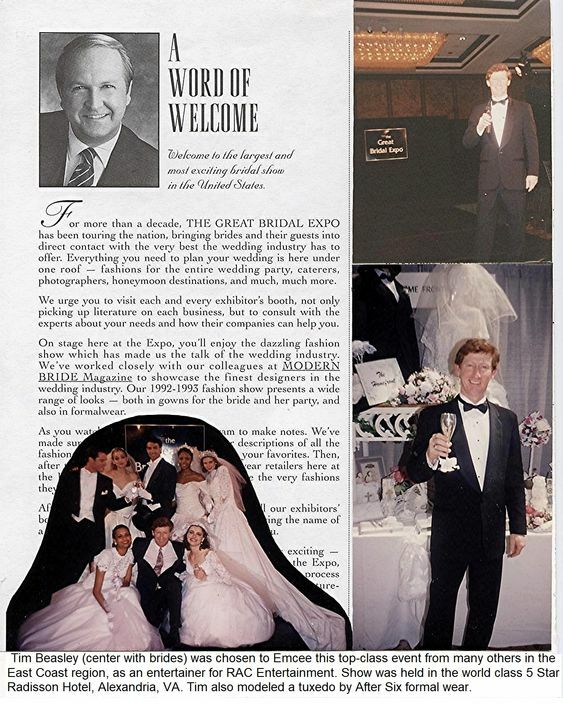 He also emceed the "nation's largest bridal show," Bill Heaton's Great Bridal Expo in Washington, DC metro area of Alexandria, VA, featuring the world's top bridal fashions and models. 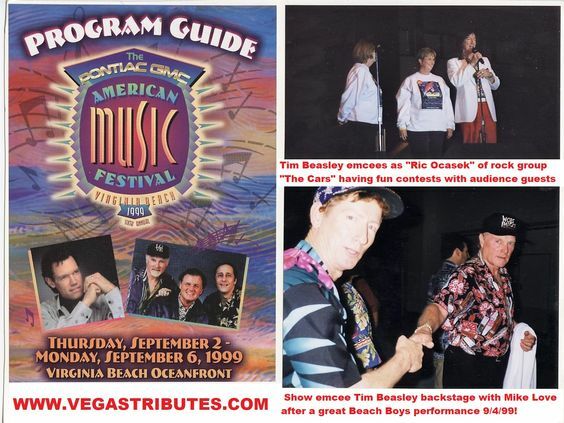 Another grand event was emceeing for entertainment-venue giants Clear Channel - Live Nation for their 3 summer tourists' seasons with his unique variety family fun show, "The Beach Tonight Show" where he performed as TV host great "Johnny Carson" introducing all of the feature acts. 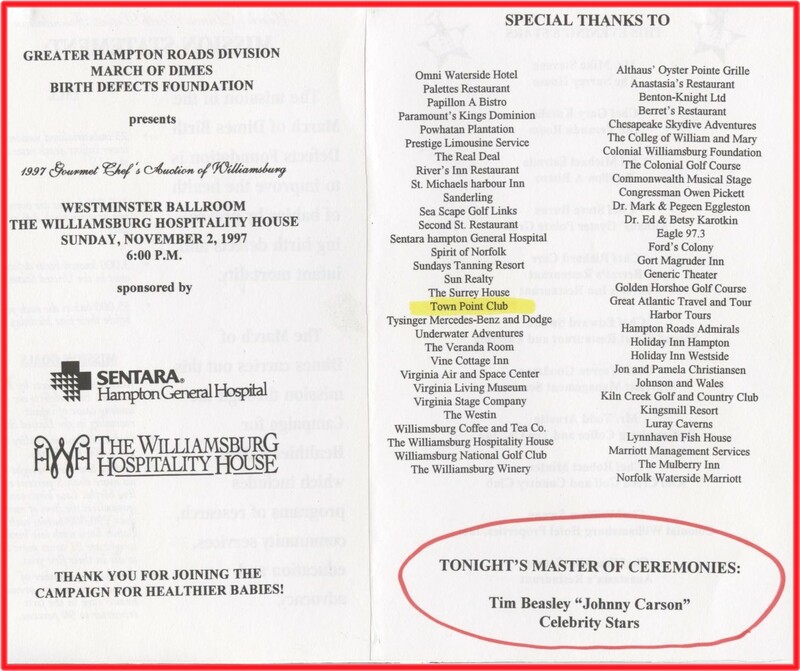 As Johnny Carson was also considered the "King of Emcees," Tim Beasley used that persona many times, hosting a grand list of events, from charitable causes such as for the Lions Club, March of Dimes, Easter Seals, MDA, United Way and specific cancer, heart, lung, diabetes medical research organizations, Police, EMS and Firefighters events, reunions, awards banquets, even fun and high-society "Oscars Parties." The many socials - fund raisers and festivals wanted Tim for his "quick on his feet" ability to ad-lib and adjust to any schedule changes and replies to spontaneous situations, and make everything in a program move seamlessly with a touch of humor and good will. 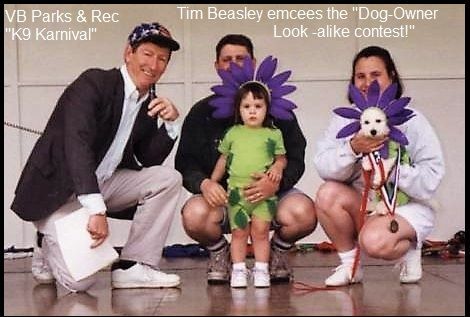 They also would employ Tim in his multi-faceted abilities as a "character actor" for adding the glamor of a fun "superstar" as the emcee. 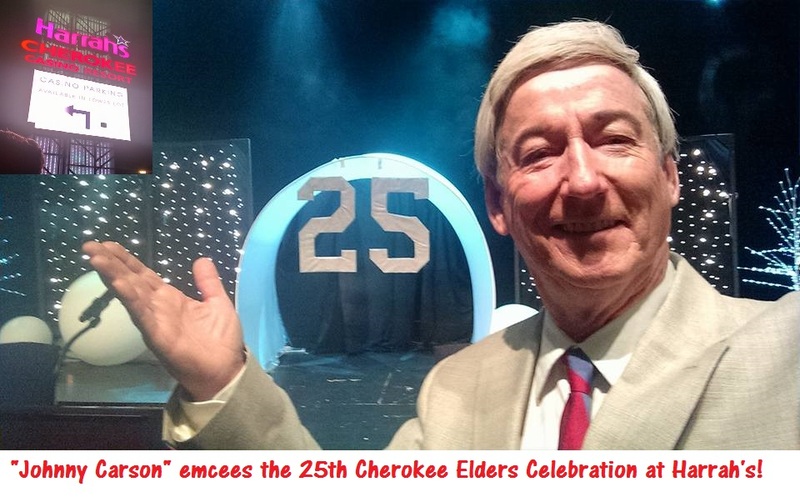 You'll see in the following photo essays, a scrap book of events all the way back to his first, in the 1980's to present day, such as his major event illustrated at the top of this page recently at Harrah's Cherokee Casino & Resort, Cherokee, NC. 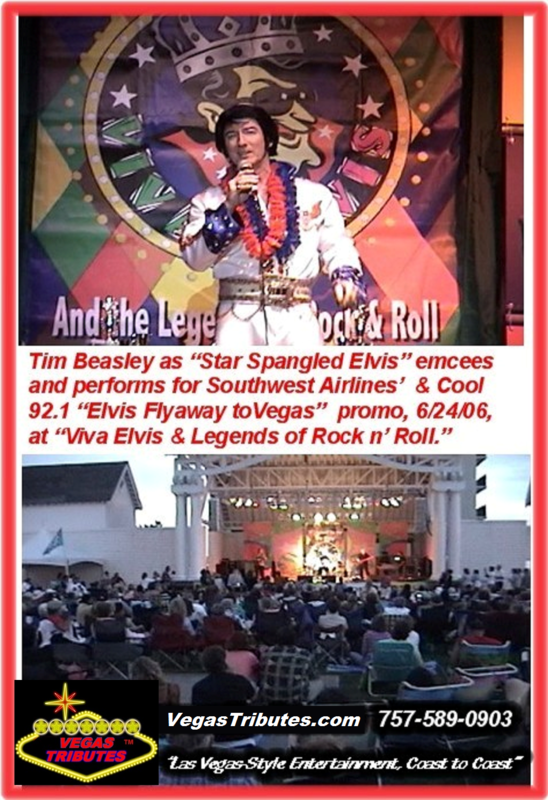 In similar fashion, he was "Star Spangled Elvis" emceeing the huge 4-day "Viva Elvis Festival" for the Virginia Beach tourists for 16 years, from 1996 to 2012! 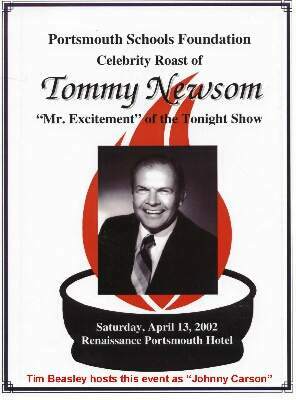 Another very long run as Emcee - Host - Entertainer was 17 consecutive years (1999 to 2016) for the huge annual 4-day custom car events, twice a year, (34 engagements as Emcee) in Ocean City, MD for "Cruisin' Ocean City" every May, and "Endless Summer Cruisin'" every October. 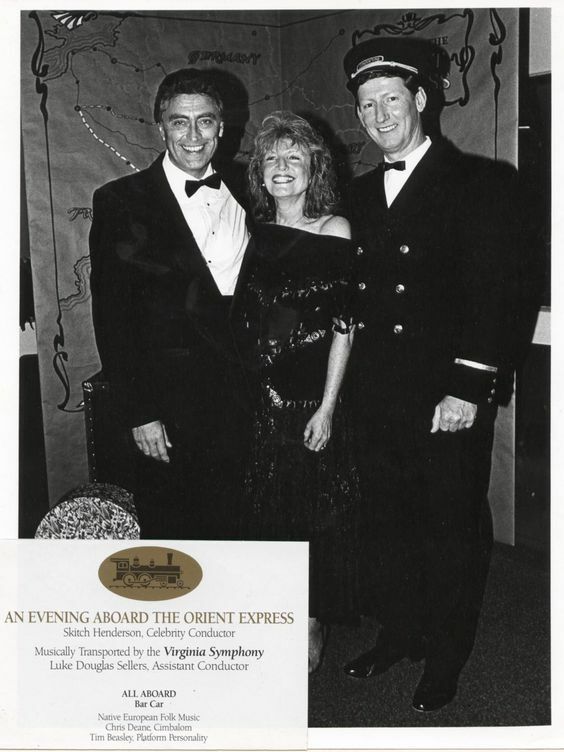 For these 34 events he was also the host of the "Welcome Cruisers" party reception - performances at Seacrets, one of the largest nightclubs on the East Coast. Also on the event's main stage he would interview guest stars, that include Henry "The Fonz" Winkler, Donny Most and Ansom Williams, Marion Ross and Cindy Williams of the popular "Happy Days" and "Laverene and Shirley" hit TV comedies, also John "Bo Duke" Schneider and Ben "Cooter" Jones of another hit series, "The Dukes of Hazzard" and also Paul Michael Glaser of "Starsky & Hutch," Joyce DeWitt of "Three's Company," and many stars from the movies "American Grafitti," "Christine," "Baywatch." Tim is also a big supporter of "the arts" and likewise, the arts community has called on him to add flavor and zest to quite few of their special fund raiser and PR events by becoming an Emcee with their "theme." For example. the Virginia Beach Center for the Arts called upon him to emcee and entertain with his "celebrity emcee" role "Ned Racine," a character portrayed by William Hurt in the steamy mystery movie, "Body Heat" for their "Body Heat" themed fund raiser party social...A big hit! 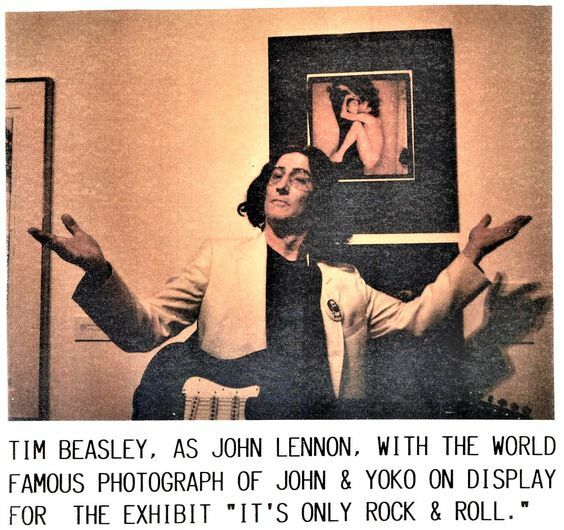 Also he was "John Lennon" for them when the famous photos of Annie Libowitz of John Lennon and Yoko Ono were brought to display at the museum, and many other fun social events, too! The popular artists organization d'Art Center in downtown Norfolk, VA, had Tim emcee for 4 of their annual fund raiser galas...the top socialites of Norfolk were the attendees in an entertaining blend of different themes for each year. Professional Emcee Licensed and Insured Since 1986!! !